Carnival transforms the streets of Valletta with its wild costumes, colourful floats, parades, booming music, dancers in character, and the sound of children’s laughter. 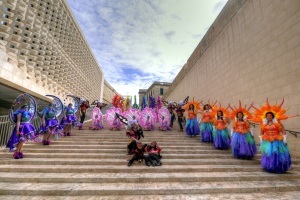 Carnival is one of the oldest cultural events celebrated in Malta. Local aficionados spent a whole year in secrecy preparing for the four days of events to participate and compete in the Carnival parade. 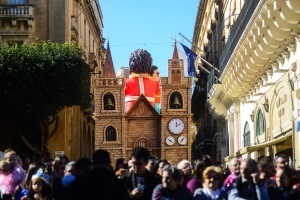 Beautiful and colourful floats which depict all sorts of people, animals and mythical creatures, throng the streets of Valletta with dancers in elaborate costumes partying aboard. 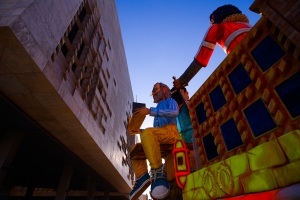 Carnival float building in Malta is an art inherited through family generations and enthusiasts take great pride in their work. 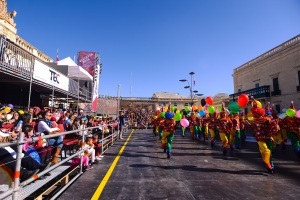 Carnival days in Valletta also host a number of marching bands, costumed children and youths enjoying the merriment along the historic streets, whilst various costumed dance groups perform in Pjazza San Ġorġ with families enjoying the show from purposely set-up stands.